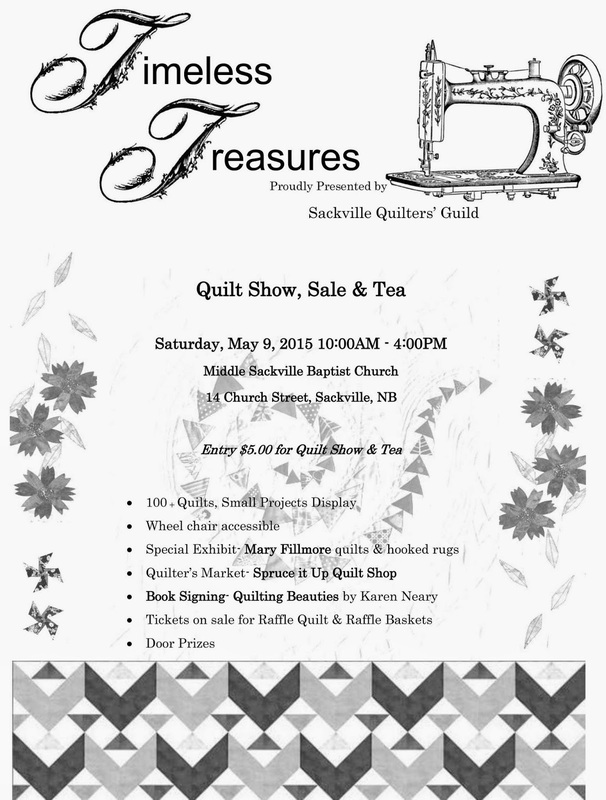 With another quilt display and book signing on the weekend behind me, we're in the home stretch for the final gig in May. It's a big one for me, one which has been in the planning for many months: a visit to my friends at La Guilde Acadienne de Clare in Saulnierville. 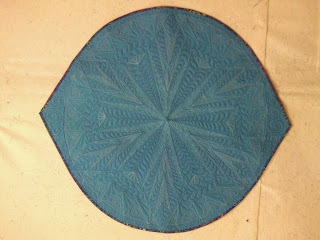 It will take most of Friday to get there, leaving just enough time to check it at a beautiful inn, have a bite of supper, and get set up for the trunk show that evening. I am taking mostly New York Beauty quilts (I have a lot of them!) along with a few other favourites. Instead of packing everything in boxes, I am opting this time to wrap the quilts around pool noodles. They are lightweight and easy to transport. 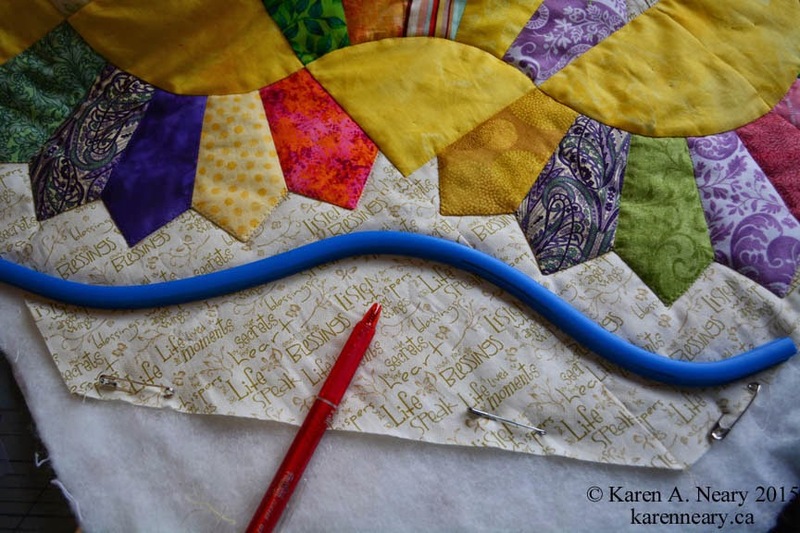 I learned this tip from other quilt instructors, and it's a great idea. I think there will be 4 or 5 noodles full which can simply be unrolled on a table in the correct order for my talk. The noodles will be colour-coded of course so I can easily separate the "chapters" of the narrative. (Can you spell OCD? :) Our dining room has been piled high with boxes of books, quilts, patterns, and workshop kits for several weeks as it was much easier to leave things there, handier the door, than lug them all back into my work room each time after a display. May has been a very busy month. I thank my ever patient family for putting up with all of this - we'll soon have the room back to use for meals! 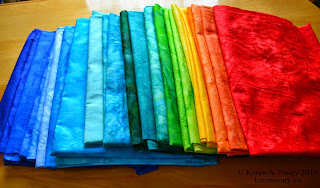 I doubt there will be much sewing done this week. The machine will need to be cleaned, oiled, and packed up by Wednesday. It's hard to settle down to create when your head is busy going over workshop details; it always makes me think of the adage about serving two masters. 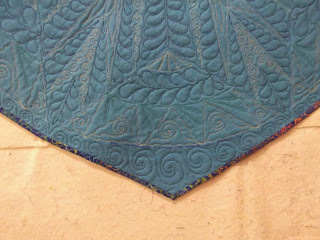 For my quilts to be successful, I need to be focused and fully in the zone, otherwise I am disappointed with my results. 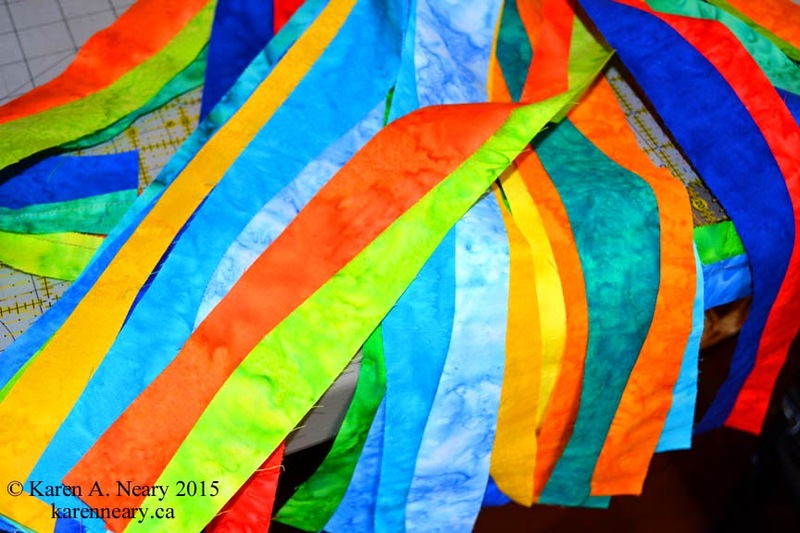 This is as far as I've gotten sewing those fabulous Hoffman water colours, I cut the fabric into strips and have been sewing them back together with a slight curve. I can't wait to show you what this is going to be. Here's a hint: it involves this gorgeous Vizzy zipper! A new selection of Hoffman 1895 watercolours - 22 luscious shades! They have the most intriguing names too: Cobalt, Waikiki, Lapis, Blue Jay, Atlantic, Azure, Election Day, Peacock, Earth Day, Betta fish (I had to Google that one! ), Sea Salt, Belize, Stove Green, Jade, Chameleon, French Lime, Gecko, Citrine, Buttercup,The OC (? ), Pumpkin, Halloween,and Flame. I wonder who gets to name them? 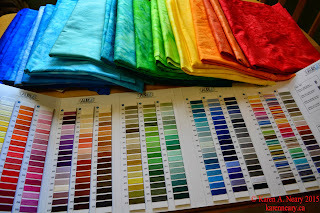 The only thing more fun than playing with these fabrics, is matching them up to thread colours. Off to iron, and dream - heaven! May is one of those months where quilting and bee-keeping collide, as it's always the busiest time of year for both ventures. 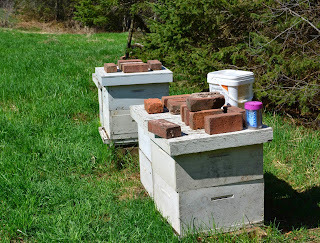 Hubby and I took time on the long weekend to get the bees caught up to speed. 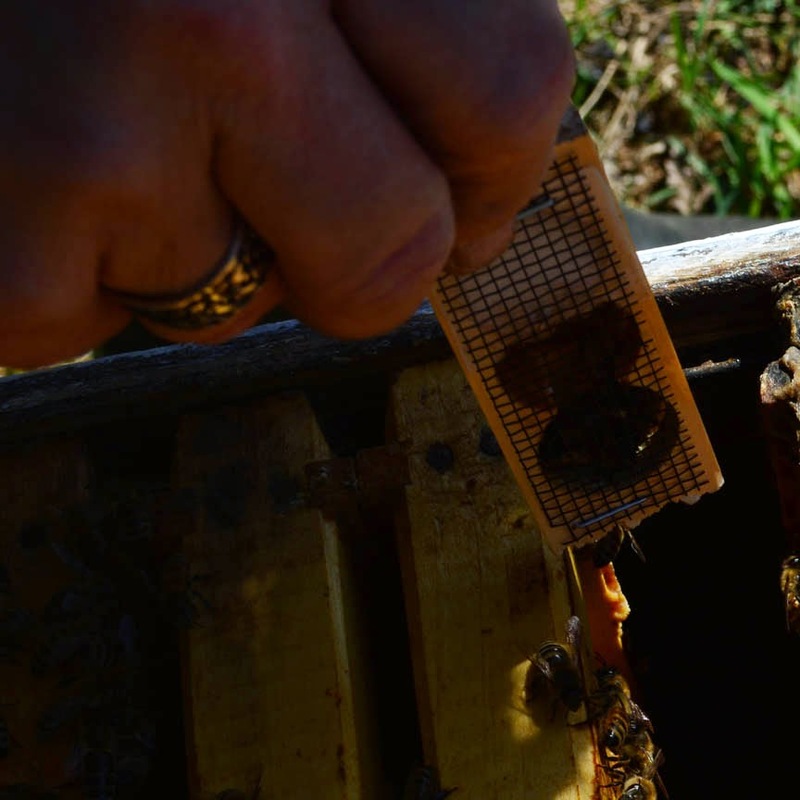 The last two winters have been very hard on them, and the number of hives has decreased substantially. However, the remaining hives were strong enough in numbers to split. Hubby purchased new Hawaiian queens. I always feel so sorry for these ladies, leaving such a beautiful homeland behind. 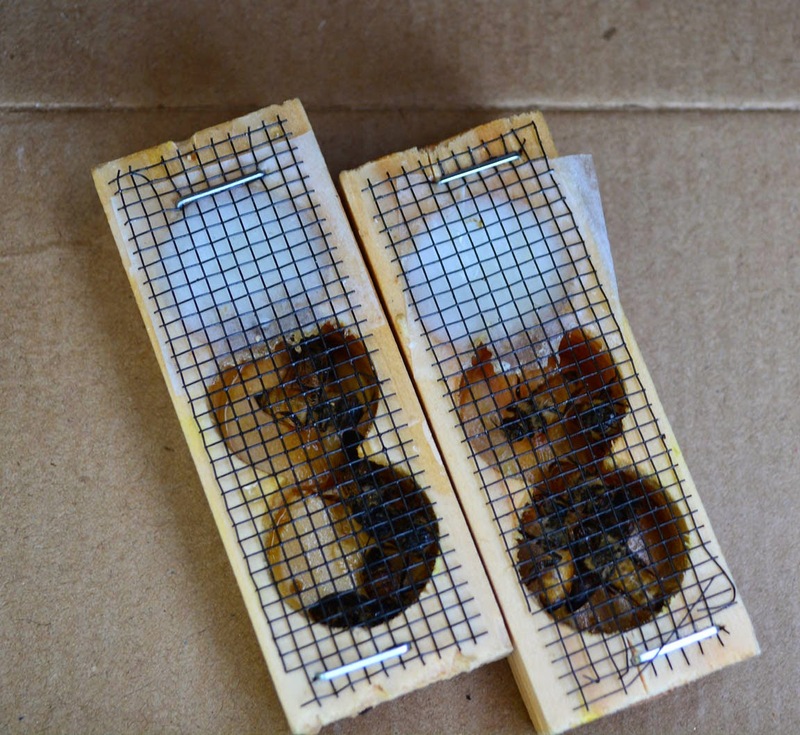 They come packaged in little wooden crates, with several attendants, and a sugar plug at the end of the box. Once the cage is placed inside the new hive, the worker bees start chewing through the sugar from both ends to release the queen. 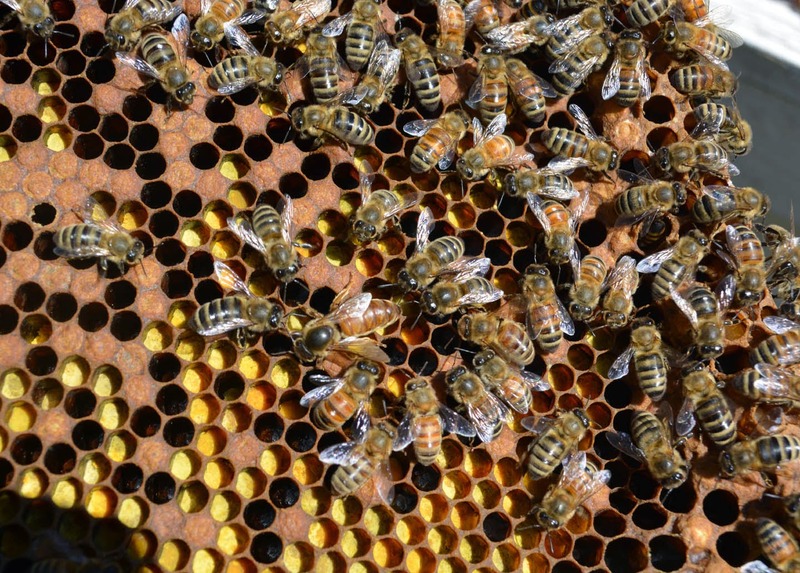 It's a tedious task to go through the hives frame by frame, bee by bee, to spot the queen. 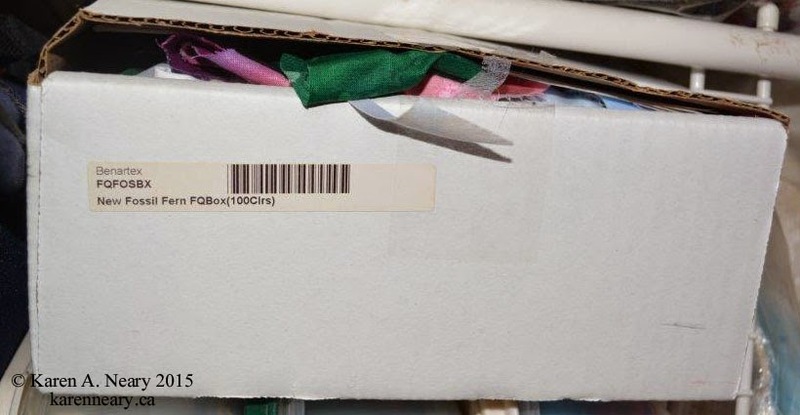 You hope to find her on the very first frame but naturally that never happens. We had to go through these two boxes of bees twice to find this queen. Can you see her below? 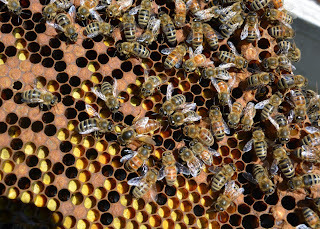 What's interesting about this pictures is that the workers are in formation, circling the queen. 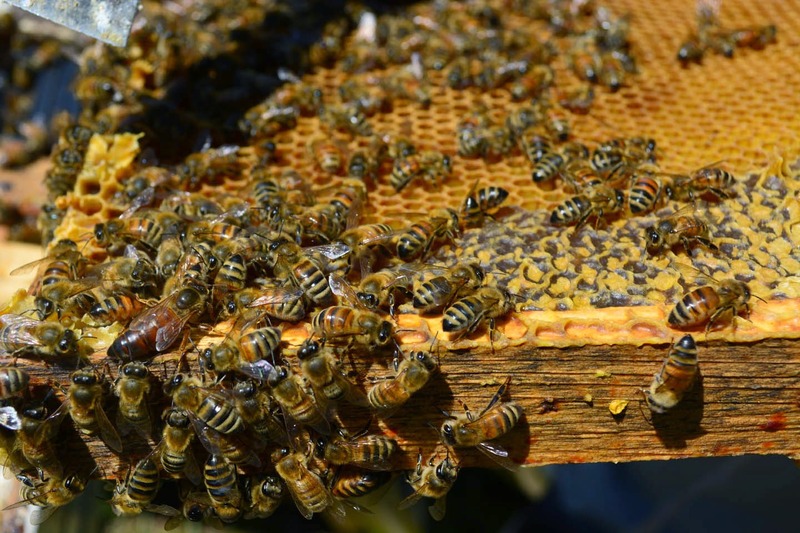 You can see the cells are filled with yellow pollen, stored up to feed new babies. That queen stays in the old hive, and half of the frames - which include brood - are put in a separate hive to join the new queen. 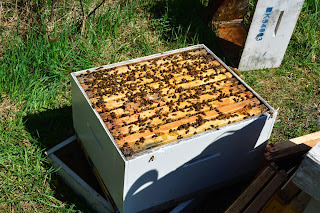 Hubby places the queen crate between two frames. Next week when we go to check, the queen will be busy laying eggs in her new abode. 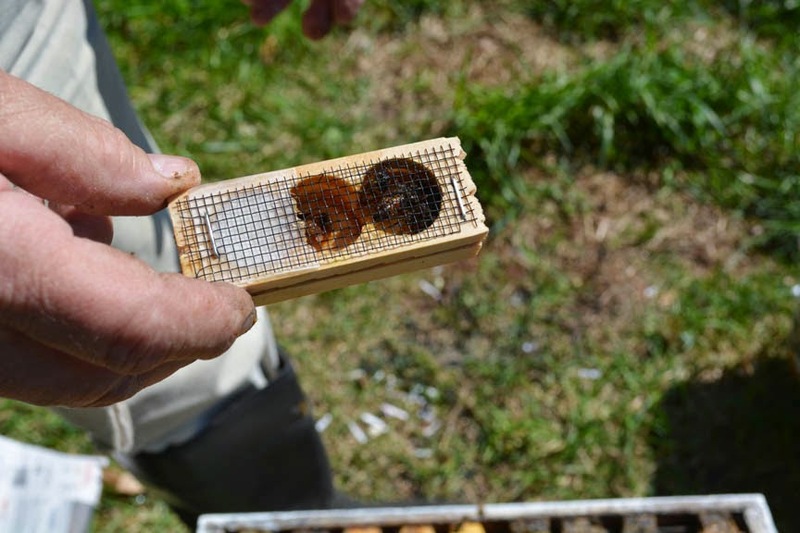 Then the process is repeated for the remaining hives. 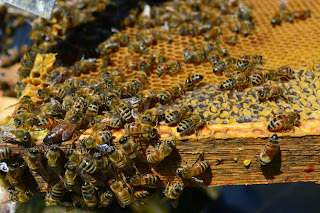 Can you find this queen? 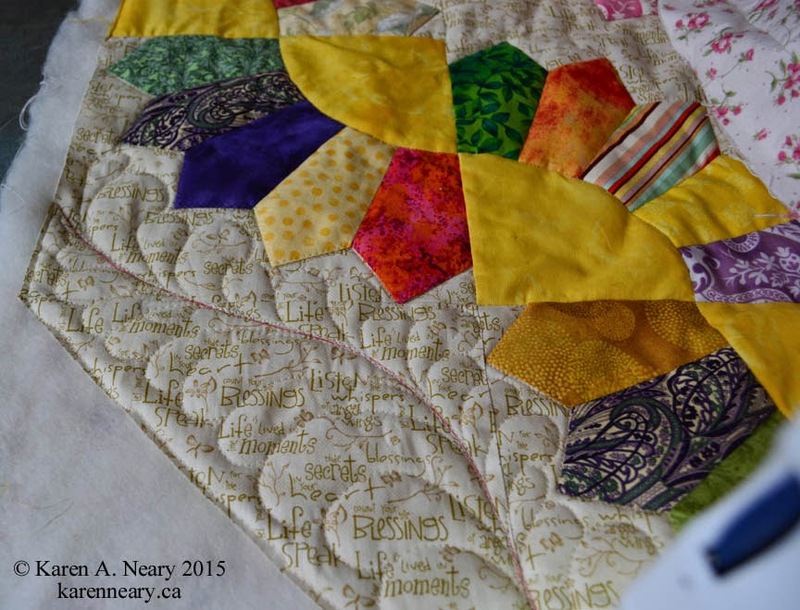 My latest quilt is designed with mothers and grandmothers in mind. I had hoped to have this ready by Mother's Day but we're just a little off that mark. It's bright and happy, with an old-fashioned look. It's a totally scrappy Dresden Fan with colours randomly placed. My only rule was one green blade per section. 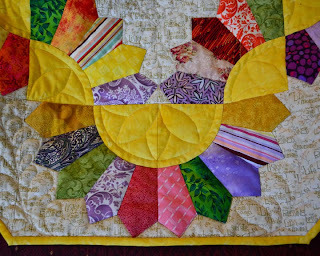 The yellow centres are Stof Quilter's Rose, and the background is Cottage Basics from Red Rooster Fabrics, both from Mrs. Pugsley's. The background fabric seemed very appropriate as it is printed with words like "Blessings" and "Life lived in moments". My Mom was certainly a blessing. 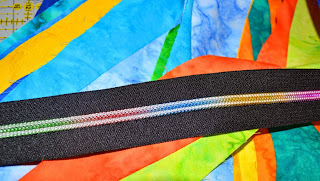 The blades are fast and easy to stitch, and no raw edge to turn under as the point is enclosed in a seam. The blades and fans went together really quickly. 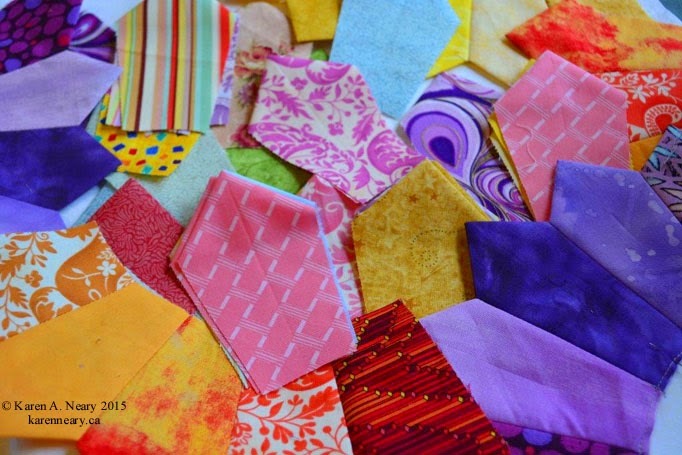 What a great use of scraps, you could sew these forever. All the threads used were Aurifil cotton Mako 50, both for piecing and quilting. 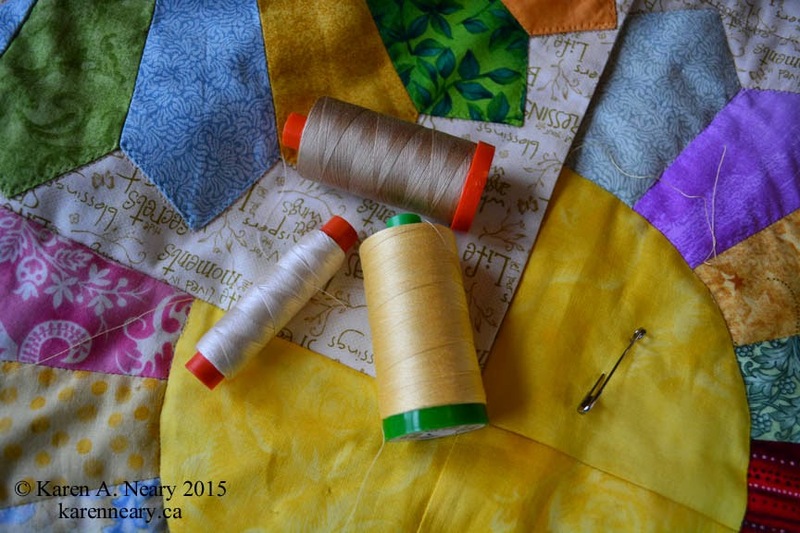 The quilt is backed with flannel and interlined with a wool batting. It's so cuddly, I wanted the quilting "loose" to maintain the softness and drape. Basically, there are free form feathers running up the sides and the blades are simply outlined. The yellow centres have a petal quilted in each. It's a non-traditional setting for sure, with big "flowers" at the top. 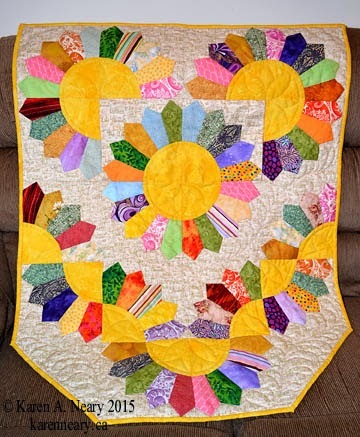 The fans dip playfully to the bottom to echo the shape of the quilt. 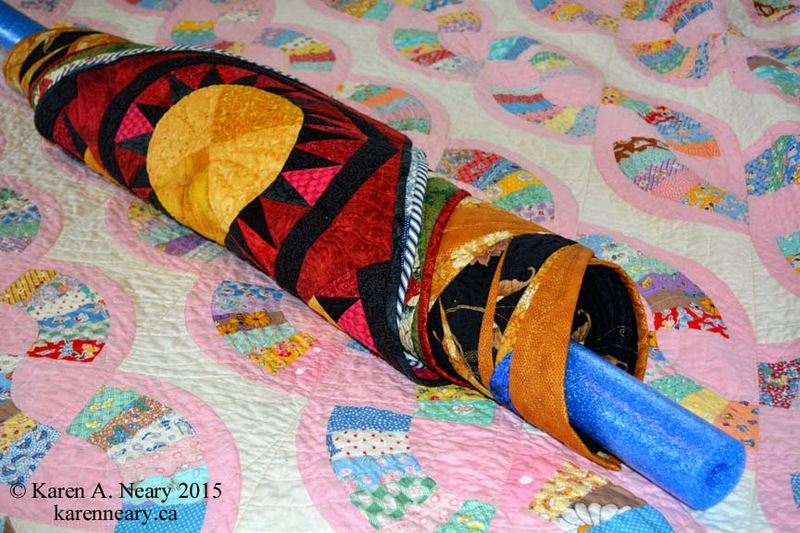 The bottom edge is angled so that this quilt can be used in a wheelchair without getting tangled up in the tires. Another special feature of the quilt is this secret kangaroo pocket stitched into the quilt under the second row of fans. You can slip your hands in, like an old-fashioned muff, to keep them warm. The pocket is lined with flannel so it's a cosy spot for cold hands. The pattern includes instruction for these microwavable hand warmers, sized to tuck into the pocket. 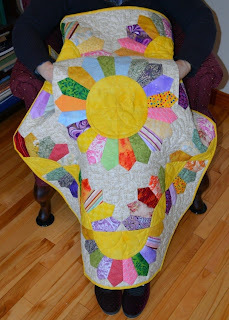 I've been using the quilt on cold mornings as I work at the computer; it's just the right size. You can download the pattern for Wrapped In Love through Craftsy here. I'm all packed; see you there! 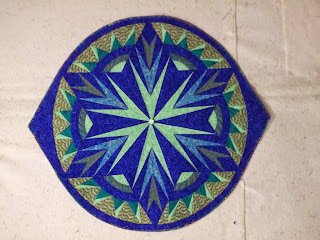 These pictures belong to Joanne Colleaux of British Columbia, who has just completed a stunning version of Ostentation. 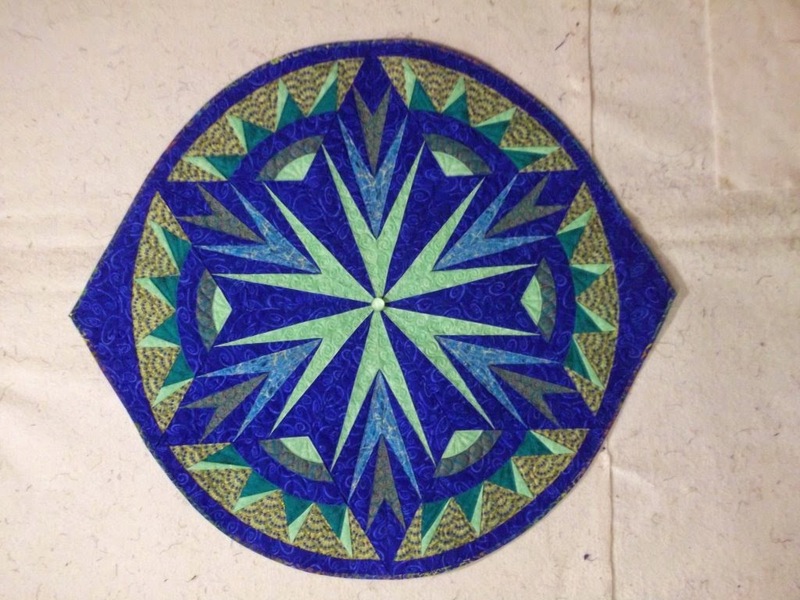 Joanne's bold colour choices show off the design beautifully. 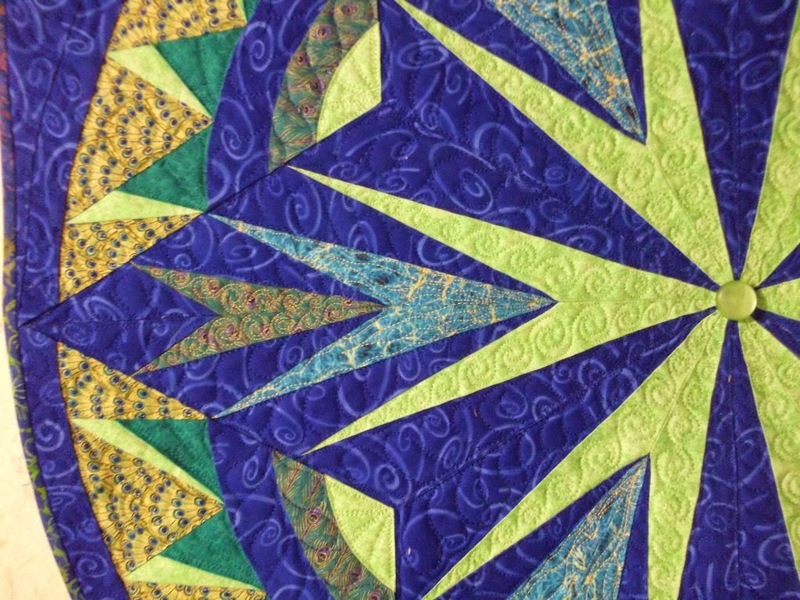 Joanne chose to applique her curved seams rather than piece them; instructions for this alternate method are included in the general directions at the front of the book Quilting Beauties. Her quilting is just spectacular. 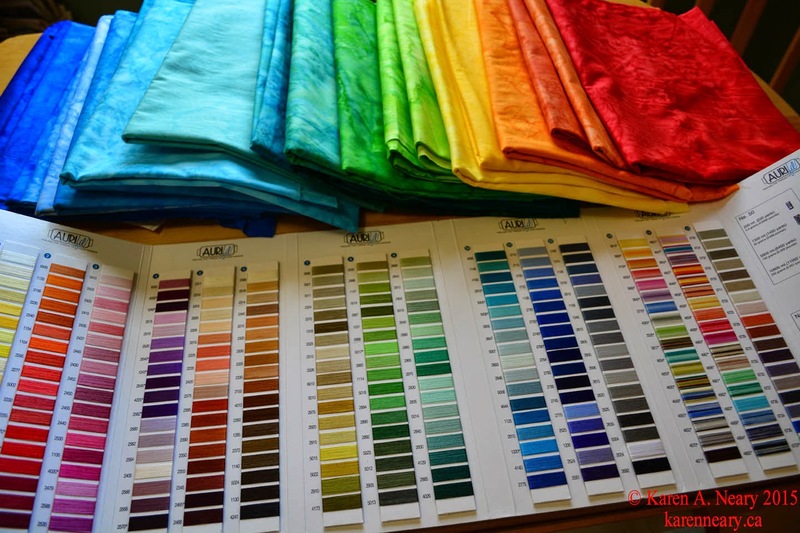 You can find the pattern for Ostentation in the book Quilting Beauties. 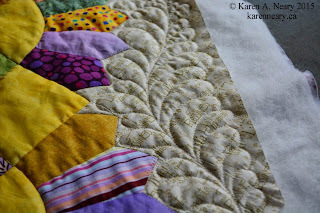 Yesterday, the dreaded task of basting the scrappy Dresden quilt was accomplished, so today is all about the quilting. Once the stitch in the ditch was finished, out came the free motion foot for some feathery fun. 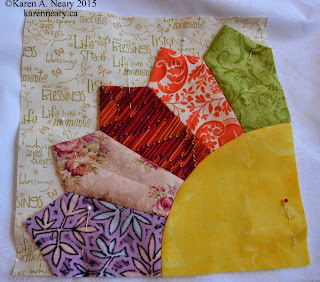 I chose 50 weight Aurifil Mako cotton, in colours to match the background and a size 80/12 topstitch needle. 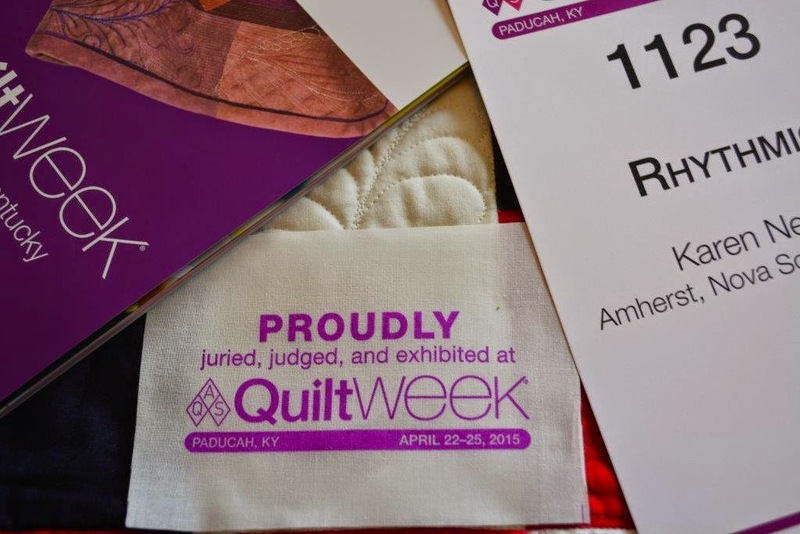 I am not keen on marking; I am more the "fools rush in, fly-by-the-seat-of-my-pants" kind of quilter, but I did use a flexible ruler and Frixxion marker to rough out the spine. This allowed me to keep the curve consistent on each side of the centre. The feathers just naturally flow in to fill the space. So far so good. 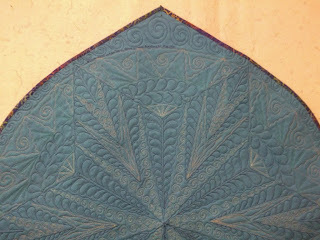 I haven't sorted out how to quilt the fan blades as yet, but hopefully inspiration will hit by the time I get the feathers stitched. It was worth the mess! What are the odds? (pretty good actually...!) 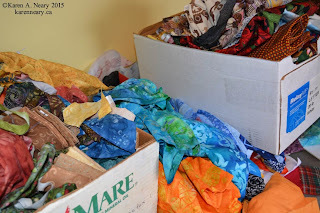 I decided it was time to downsize, and I ruthlessly culled three boxes and two garbage bags of fabric from my stash. 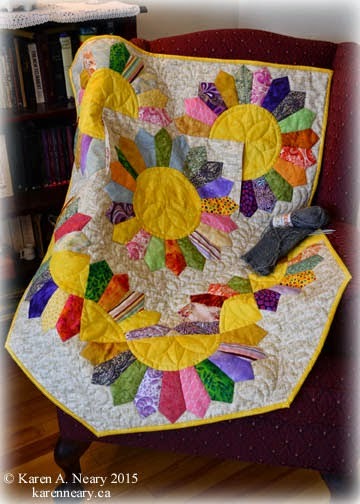 I set them aside to deliver to some quilting friends when I visit next month, and happily revelled in all the extra space I had reclaimed. Yesterday, I woke up with a burning desire to sew colourful scrap Dresden Fan blades and...I don't have to write the rest, we all know what happened. Yup...I brought those bags and boxes back into my sewing room. I loved seeing my old friends, from projects past. At what point does O.C.F.C. become hoarding?